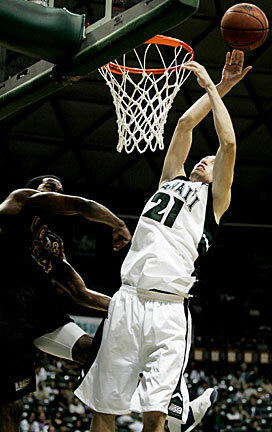 North Carolina A&T's Jason Wills fouled Hawaii's Matt Lojeski during the second half last night at the Stan Sheriff Center. HAWAII managed to avoid becoming the first team to lose to North Carolina A&T this season. But keeping the Aggies winless was far from easy. UH trailed for most of the first half and saw a 13-point second-half lead shrink to four in the final minute. But the Rainbow Warriors hung on for a 66-60 victory before a crowd of 4,260 last night at the Stan Sheriff Center. Both UH and NC A&T have struggled with injuries lately, but the Rainbows overcame a season-high 21 turnovers and had just enough to hold off an Aggies team playing its fifth straight road game. "No excuses. We just have to get mentally prepared to play," UH coach Riley Wallace said. "We're at home and they're all over the country. They're the ones who should be leg-weary. ... But we're the ones playing physically and mentally drained right now." Forward Julian Sensley returned to the lineup after missing last Friday's game against Northwestern State to lead the Rainbows with 18 points. Forward Matthew Gipson finished with 13 points and 13 rebounds and Ahmet Gueye posted 13 points and eight boards. Guard Matt Lojeski finished with 16 points, hitting all six of his free-throw attempts in the final minute to thwart an NC A&T rally. "I think we've been trying to get by on our talent," said Sensley, who is recuperating from a strained Achilles'. "We have to find it within ourselves and as a team to come out and play harder." Hawaii had just nine players available for the second straight game. Center Chris Botez was sidelined after suffering an inflammation of the muscles in the rib cage earlier in the week. Just as Hawaii has had to fill holes in its lineup due to injuries, the Aggies suffered their share of mishaps so far this season. Their leading scorer last season was declared ineligible prior to the season. They also lost a point guard to a season-ending shoulder injury and had another dismissed from the team. NC A&T's recent problems contributed to losses by an average of 32.3 points in its four games leading up to last night's contest. 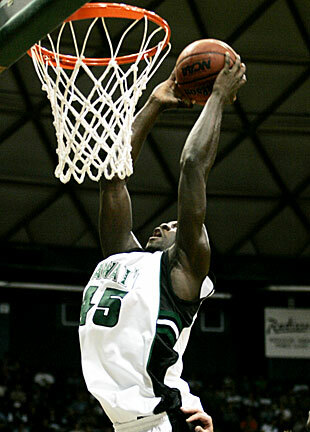 Hawaii's Ahmet Gueye threw down a dunk during the first half of last night's game against North Carolina A&T. But the Aggies led early against UH as the Rainbows labored through a frigid first half. The teams went into halftime tied at 27 and stayed close for most of the second half. Jason Willis led NC A&T with 17 points and Trahern Chaplin and Demetrius Guions added 13 each for the Aggies. "We're just trying to get it together, little by little," NC A&T coach Jerry Eaves said. "It was good for us to come out on the road, we've had a lot of losses in our offensive production but we're coming together as a team more defensively." UH made nine of 35 shots (26 percent), going 2-for-14 beyond the 3-point line, and trailed for most of the first half. Still, the Aggies couldn't build more than a five-point lead. The Rainbows took a bit of momentum into the locker room when Sensley nailed a 3-pointer from the left wing with 2 seconds left to tie the score. The teams remained within a few points of each other in the second half before UH went on an 11-2 run to gain some breathing room. UH opened up a 47-40 lead when Sensley hit a jumper from the top of the key, then converted a steal into a breakaway dunk with 9:35 left. The Rainbows stretched their lead to double digits when Lojeski hit a 3-pointer to put UH up 52-42 at the 7:41 mark. UH moved ahead by 13 points only to see NC A&T close to within 60-54 with a minute left when Greg Roberts made a layup while being fouled and converted the free throw. After Lojeski made two free throws, Demetrius Guions made two shots from the line as well and the Aggies scored on a tip-in to trail 62-58 with 21 seconds left. But Lojeski continued to make his foul shots down the stretch to secure the win for UH. The Rainbows return to the Sheriff Center tomorrow to face the University of Pennsylvania. Tip-off is set for 7:05 p.m.
Halftime -- NCAT 27, Hawaii 27. 3-point goals -- NCAT 4-15 (Chaplin 3-5, Guions 1-4, Powell 0-1, Crumpton 0-2, Hayes 0-3), Hawaii 5-22 (Lojeski 2-7, Sensley 2-10, Gipson 1-1, Waters 0-1. Tatum 0-3). Personal fouls --NCAT 21, Hawaii 14. Fouled out--none. Steals -- NCAT 9 (Wills 5, Booth 2, Chaplin, Hayes, Roberts), Hawaii 8 (Lojeski 3, Sensley 2, Gipson, Tatum, Thompson). Blocked shots -- NCAT 2 (Roberts, Williams), Hawaii 1 (Gueye). Turnovers -- NCAT 22 (Wills 7, Guions 4, Powell 3, Crumpton 2, Faison 2, Booth, Chaplin, Roberts, Williams), Hawaii 21 (Gueye 6, Sensley 4, Gipson 3, Tatum 3, Thompson 3, Lojeski 2). Officials -- Stupin, Reynolds, Apo. A -- 4,260.